The Hundred is still seen early on in the fitilates repertoire. Given our rounded forward posture and the amount of sitting we know do in a day, we believe that we need a focused warm up before moving into a more technical and difficult exercise such as the Hundred. Pilates also never modified the Hundred like we see in modern day teaching. The expectation was to pick your legs up straight off the mat while at the same time curling your upper body forward, hovering just parallel to the ground the whole time. Done correctly the Hundred provided a full body workout, that created an increase in heart rate, breathing and muscular warm-up. So, why the modifications in the fitilates Hundred? There are a few reasons that we believe modifying this exercise is crucial to most participants. Pilates primarily worked with dancers, athletes and fairly fit (military) individuals; not to mention himself. They already possessed a fairly good understanding of body awareness and muscle control. The fitilates method is devised for all abilities and therefore modifications should be made to account for their current ability. 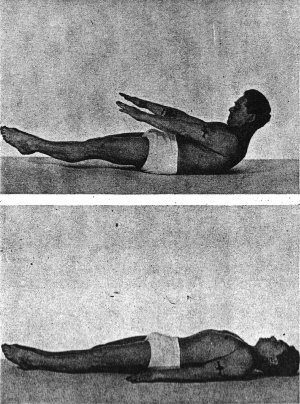 Pilates method was developed through his participation and study of other of other forms of movement and exercise such as yoga, boxing and gymnastics. As a man, his centre of gravity is considerably lower making it much easier for him to float from the ground into the desired Hundred position. A woman’s centre of gravity is much lower, making this position difficult to attain, regardless of strength and practice. fitilates and Pilates mat classes, tend to be in a group setting now, versus the one on one or small groups that Pilates would have worked with in his studio. Bigger classes require modifications be made for the safety of all participants. Although the common goal of full extension, parallel to the ground is still there, different body types, ability and history of injuries, will impact what modification is most appropriate for them. The Hundred remains an important exercise in the fitilates repertoire and can be a great indicator of success in other exercises such as the Roll Over and Teaser series. It’s ability to be modified for all abilities and levels also makes it a great choice for those just starting. Whether you practice classical Pilates or participate in a more contemporary method such as fitilates, the importance of quality over quantity remains the same. It is much better to perform 20 perfect pumps; than 100 poorly executed ones!